"Forced Socialization" - what is it, how does it work, where can it go wrong? Better still, "Trust Training" - what is it, how does it work? The problem: We want pet rats to trust us, but if a rat has come from an abusive environment, or has just never been handled, that rat will naturally hide in her box and want nothing to do with us. If we sit and wait and do absolutely nothing, it will take a long long time for the rat to even venture out. Even then, trust doesn't *just happen*. Well, it can happen, sometimes, with the right rat and the right person, but rarely. So what do we do? 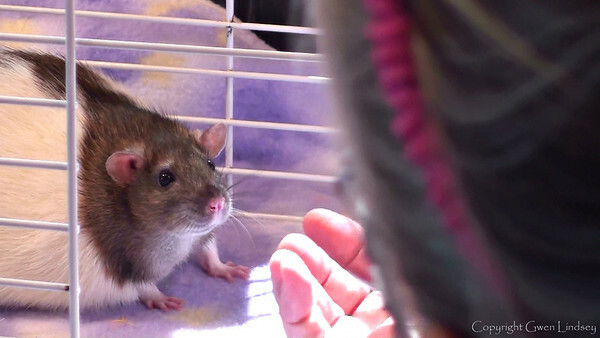 There are many suggestions for helping a rat overcome her fear and/or shyness. Some of them aim to figure out the best and quickest methods, and one of those has come to be called "Forced Socialization." This page is under development, and although I plan to start off with some other material on trust training, for the moment here are some comments about the popular method called "Forced Socialization." First of all, this is important: No good socialization technique involves force. The word "force" can be extremely misleading. However, the method first described by Jane Adamo ( read Jane's method here), is extremely important. There is much to understand about the psychology of rats that her method begins to explore. • For the purposes of holding your rat to socialize her, do not grab her out of the cage. Do not chase her to get hold of her, do not try to "prove" to the rat that she cannot escape you by doing whatever it takes to grab her. The fear state you will trigger in her by insisting that you will always "win" the catch, will work against you. There are methods to help teach her it is okay to come out of the cage, if that is a problem. • When you hold your rat, as you work with her fear behaviors, never hold her to the point where she squeaks or squeals to get away from you. As a prey animal, she needs to be able to escape to safety and it's desirable to support her doing that. You can engage in forms of holding and be completely successful with socialization while doing this. • The "hold your rat for 20 minutes" rule does not mean "at all costs."